2006 McGaughey, R.J., H.-E. Andersen, and S.E. Reutebuch. 2006. Characterizing Vegetation Structure Using Discrete-Return, Airborne Laser Scanner Data. Presentation at the National meeting of The Wildlife Society. Sept 2006. Anchorage, AK. 2006 Andersen, H.-E., S.E. Reutebuch, and R.J. McGaughey. 2006. Forest measurement and monitoring using high-resolution airborne LIDAR. Society of American Foresters (SAF) North Puget Sound Chapter meeting, June 14, 2006, Mount Vernon, WA. 2006 Andersen, H.-E., S.E. Reutebuch, and R.J. McGaughey. 2006. Forest measurement and monitoring using high-resolution airborne LIDAR. Oregon State University American Society of Photogrammetry and Remote Sensing (ASPRS) Student Chapter meeting, June 2, 2006, Corvallis, OR. 2006 McGaughey, R.J., H.-E. Andersen, and S.E. Reutebuch. 2006. Considerations for planning, acquiring, and processing LIDAR data for forestry applications. Eleventh Biennial USDA Forest Service Remote Sensing Applications Conference, April 24-28, 2006, Salt Lake City, UT. 2006 Andersen, H.-E., S.E. Reutebuch, and R.J. McGaughey. 2006. Forest measurement and monitoring using high-resolution airborne LIDAR. Society of American Foresters (SAF) South Puget Sound Chapter meeting, March 16, 2006, Fife, WA. 2006 McGaughey, R.J., H.-E. Andersen, and S.E. Reutebuch. 2006. LIDAR Remote Sensing for Characterizing and Visualizing Vegetation Structure. Presentation to NOAA National Marine Fisheries Staff. March 15, 2006, Seattle, WA. 2006 Andersen, H.-E., R.J. McGaughey, and S.E. Reutebuch. 2006. EARSeL Workshop on 3D Remote Sensing in Forestry, Vienna, Austria, February 14 - 15, 2006. University of Natural Resources and Applied Life Sciences (BOKU), Vienna, Austria. 2005 McGaughey, R.J., H.-E. Andersen, and S.E. Reutebuch. 2005. LIDAR applications in forestry. Presentation to the annual University of Washington, College of Forest Resources Alumni Association. Nov 4, 2005. Seattle, WA. 2005 McGaughey, R.J., H.-E. Andersen, and S.E. Reutebuch. 2005. LIDAR Remote Sensing for Characterizing and Visualizing Vegetation Structure. Presentation at the National Meeting of the Society of American Foresters. Oct 19-23, 2005, Fort Worth, TX. 2005 Andersen, H.-E., S.E. Reutebuch, and R.J. McGaughey. 2005. Remote Sensing Research within the UW Precision Forestry Cooperative. Weyerhaeuser Western Forestry Research Conference, October13, 2005, Skamania, WA. McGaughey, R.J., H.-E. Andersen, and S.E. Reutebuch. 2005. Comparing Estimates of Canopy Structure Derived from Leaf-On and Leaf-Off Airborne Laser Scanner Data. Silviscan: LIDAR Applications in Forest Assessment and Inventory, September 29 - October 1, 2005, Blacksburg, VA.
Andersen, H.-E., R.J. McGaughey, and S.E. Reutebuch. 2005. Assessment of LIDAR-derived forest measurements as a source of data for forest growth models. Silviscan: LIDAR Applications in Forest Assessment and Inventory, September 29 - October 1, 2005, Blacksburg, VA.
2005 Schreuder, G.F. and H.-E. Andersen. 2005. Precision Forestry: Application of Advanced Technologies to Forest Resource Management. XXII IUFRO World Congress, August 8-13, 2005, Brisbane, Australia. 2005 Andersen, H.-E., S.E. Reutebuch, and R.J. McGaughey. 2005. Forest measurement and monitoring using high-resolution airborne LIDAR. Briefing at USDA Forest Service Washington Office. July 14, 2005, Washington DC. 2005 Andersen, H.-E., S.E. Reutebuch, and R.J. McGaughey. 2005. Forest measurement and monitoring using high-resolution airborne LIDAR. Seminar at United States Geological Survey (USGS) National Headquarters, July 13, 2005, Reston, VA.
2005 Schreuder, G.F., H.-E. Andersen, R.J. McGaughey and S.E. Reutebuch. 2005. Precision Forestry: Application of Advanced Technologies to Forest Resource Management. Western Mensurationists' Meeting, July 4-7, 2005, Hilo, Hawaii. 2005 Andersen, H.-E., S.E. Reutebuch, and R.J. McGaughey. 2005. Forest measurement and monitoring using high-resolution airborne LIDAR. LIDAR workshop sponsored by the USDA Forest Service Remote Sensing Applications Center. May 17-19, 2005. Salt Lake City, UT. 2005 Andersen, H.-E., S.E. Reutebuch, and R.J. McGaughey. 2005. The Use of High-Resolution Interferometric Synthetic Aperture Radar for Forest Measurement Applications. LIDAR workshop sponsored by the USDA Forest Service Remote Sensing Applications Center. May 17-19, 2005. Salt Lake City, UT. 2005 McGaughey, R.J., S.E. Reutebuch, and H.-E. Andersen. 2005. Interactive Visualization of LIDAR Project Data: Pulling it All Together. LIDAR workshop sponsored by the USDA Forest Service Remote Sensing Applications Center. May 17-19, 2005. Salt Lake City, UT. 2005 Andersen, H.-E., R.J. McGaughey, and S.E. Reutebuch. 2005. The use of high-resolution, active airborne remote sensing technologies to support precision forestry. Second Appalachian Remote Sensing Conference, West Virginia University, May 11, 2005, Morgantown, WV. Keynote speaker. 2005 Reutebuch, S.E. 2005. Demonstration of FUSION LIDAR software for terrain and vegetation measurements. Idaho Panhandle National Forest, Supervisors Office, January 26, 2005, Coeur d’Alene, ID. 2004 Reutebuch, S.E. 2004. Measuring topography and forest structure with LIDAR: applications in forestry. Fall Forestry Educational Seminar: Forest Technology. University of Washington Pack Research Forest, November 13, 2004, Eatonville, WA. 2004 Andersen, H.-E., R.J. McGaughey, and S.E. Reutebuch. 2004. Forest measurement using high-resolution airborne LIDAR. Productivity of Western Forests: A Forest Products Focus, September 21-23, 2004, Olympia, WA. Reutebuch, S.E. 2004. Introduction to LIDAR. Natural Resource Monitoring Workshop, AmericaView Conference 2004. EROS Data Center, September 20-22, 2004, Sioux Falls, SD. 2004 Andersen, H.-E., R.J. McGaughey, S.E. Reutebuch, G.F. Schreuder, J. Agee, and B. Mercer. 2004. Estimating canopy fuel parameters in a Pacific Northwest conifer forest using multifrequency polarimetric IFSAR. ISPRS XXth Congress, July 12-23, 2004, Istanbul. 2004 Andersen, H.-E., G.F. Schreuder, R.J. McGaughey, S.E. Reutebuch, and W.W. Carson. 2004. Estimating forest inventory parameters using high-resolution LIDAR and IFSAR. 1st International Workshop on Digital Forestry, June 14-18, 2004, Beijing,China. 2004 Reutebuch, S.E. 2004. Demonstration of FUSION LIDAR software for vegetation measurements. 1st Annual Forest PARC Workshop, LIDAR: Technical Workshop, Univ. of Idaho & Upper Midwest Aerospace Consortium (UMAC), May 17- 19, 2004, Moscow, ID. 2004 Andersen, H.-E., G.F. Schreuder, J. Agee, R.J. McGaughey, and S.E. Reutebuch. 2004. Canopy fuels measurement with LIDAR and IFSAR. Joint Fire Science Program (JFSP) Principal Investigator's Workshop, April 13-15, 2004, Phoenix, Arizona. Received "Best Presentation Award" out of 67 presentations. 2004 Andersen, H.-E., S.E. Reutebuch, R.J. McGaughey, W.W. Carson, and K. Winterberger. 2004. LIDAR & IFSAR for Vegetation Measurement & Monitoring. Seminar at PNW Research Station Forestry Sciences lab, March 9, 2004, Olympia, WA. 2004 Reutebuch, S.E. 2004. LIDAR as a tool for forest inventory. 2004. National Forest Inventory and Analysis (FIA) All bands Meeting, Feb. 24, 2004, San Diego, CA. Mercer, B., J. Allan, C. Hoffman, M. Schwaebisch, S.E. Reutebuch, W. Carson, and H.-E. Andersen. 2003. P-Band Polarimetric InSAR (PolInSAR) for extraction of ground DTM beneath forest canopy. International Geoscience and Remote Sensing Symposium, July 21-25, 2003, Toulouse, France. 2003 Mercer, B., J. Allan, N. Glass, C. Hoffman, M. Schwæbisch, S.E. Reutebuch, W. Carson, and H.-E. Andersen. 2003. Extraction of Bare-Earth DEMs Beneath Forest Canopy Using P-Band Polarimetric InSAR (PolInSAR). Advanced SAR Workshop, June 25-27, 2003, Saint-Hubert, Quebec, Canada. 2003 Andersen, H.-E., R.J. McGaughey, W. Carson, S.E. Reutebuch, B. Mercer, and J. Allan. 2003. An evaluation of canopy height models obtained from LIDAR and InSAR data in a Pacific Northwest conifer forest. 2003. ISPRS Workshop on Three-dimensional mapping using LIDAR and InSAR, June, 2003, Portland, OR. 2003 Mercer, B., J. Allan, N. Glass, S. Reutebuch, W. Carson, and H.-E. Andersen. 2003. Extraction of ground DEMs beneath forest canopy using P-band polarimeteric InSAR (PolInSAR). ISPRS Workshop on Three-dimensional mapping using LIDAR and InSAR, June, 2003, Portland, OR. 2003 Andersen, H.-E., R.J. McGaughey, W.W. Carson, S.E. Reutebuch, B. Mercer, and J. Allan. 2003. A comparison of forest canopy models derived from LIDAR and IFSAR data in a Pacific Northwest conifer forest. Proceedings of the ISPRS working group III/3 workshop "3-D reconstruction from airborne laser scanner and InSAR data" October 8-10, 2003, Dresden, Germany. 2003 Andersen, H.-E., R.J. McGaughey, W. Carson, S.E. Reutebuch, B. Mercer, and J. Allan. 2003. An evaluation of canopy height models obtained from LIDAR and InSAR data in a Pacific Northwest conifer forest. 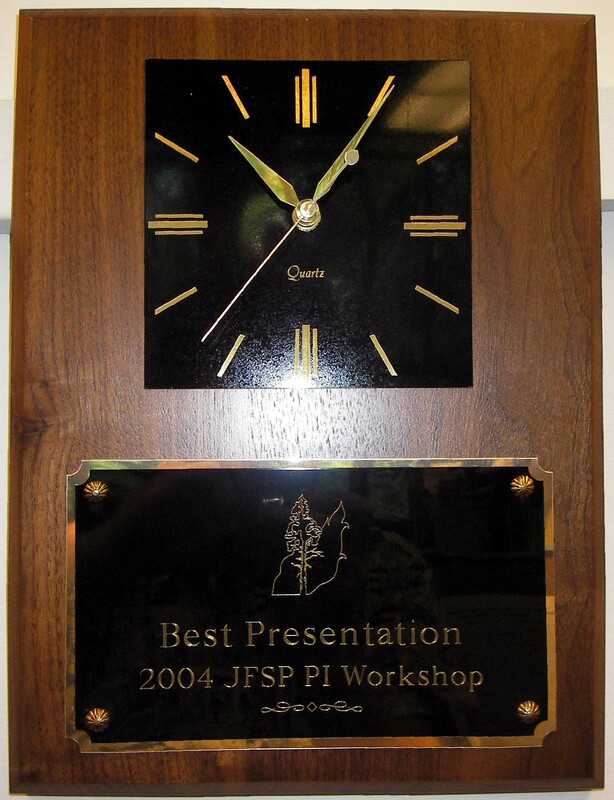 Second International Precision Forestry Symposium, June 16-18, 2003, Seattle, USA. 2003 Andersen, H.-E. 2003. Estimation of critical forest structure metrics through the spatial analysis of airborne laser scanner data. Olympic Natural Resources Center Winter 2003 GIS Conference, February 27-28, 2003, Forks, WA.